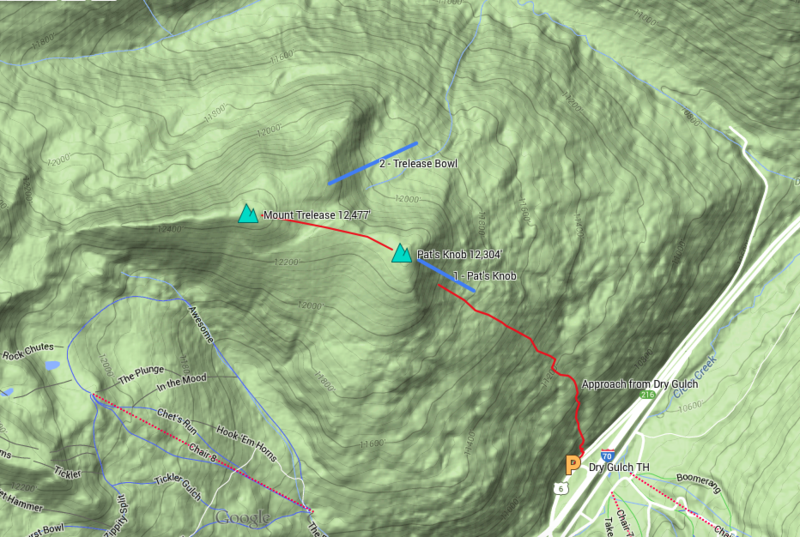 Mount Trelease is a popular skimo mountain that is easily accessible from Interstate 70. The southeast and north flanks of Trelease are popular for winter backcountry skiing. The high terrain of Pat’s Knob and Trelease Bowl are less dangerous in the spring when the snowpack has completely consolidated. The entirety of Mount Trelease is in the Loveland Ski Are special use permit. Although Loveland is not using this terrain at this time, the most recent Loveland master plan calls for guided backcountry and snowcat tours in this area. You can access Mount Trelease from the ski area’s backcountry access gate on Chair 8. This route allows you to traverse the West Ridge of Trelease to summit. Finally, Mount Trelease is the site of the tragic 1970 Wichita State Football team plane crash. The ruins of the plane crash are on the lower flanks of the mountain. If you encounter these ruins, please be respectful of this site. Pat’s Knob is a good choice for a quick spring ski mountaineering adventure. This slope is often dangerous during the winter, and a consolidated spring snowpack can make it enjoyable. The access from Exit 216 allows for a quick climb and a quick exit. From the parking area at Exit 216 scramble north up the broken terrain of the exit’s road bank to the forest. If this is early in the spring you may see a skin track leading to this point. Climb northwest through the forest, into the open glades, and then to tree line below Pat’s Knob. [39.6925, -105.8916] Climb directly up Pat’s Knob or climb to the left to access the windswept and more gentle way to the top. You can catch a quick glimpse of Trelease Bowl when driving west on Interstate 70 near the Herman Gulch exit. The bowl hangs above Dry Gulch and frequently avalanches during the winter. This is a good route to use when introducing a novice to spring ski mountaineering.